CCBT/VT SENIOR TOUR Stop #4 of the 2019 season. CHECK IN 10AM BOWL 11AM SHARP! 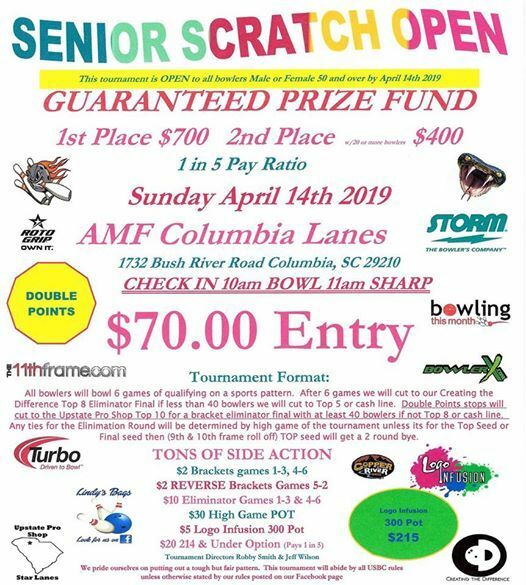 SENIOR TOUR tournament is open to ALL Senior bowlers Men, Women 50+. Must have turned 50 by tournament date. 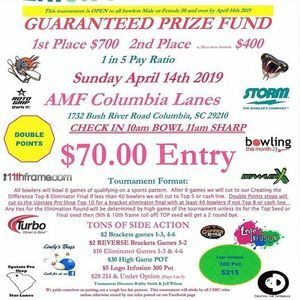 AMF Columbia Lanes tournament presented by Bowling is life, Storm Bowling, Roto Grip, Turbo Grips, Bowling This Month, Upstate Pro Shop, Lindys Bags, Creating The Difference, 11th Frame, BowlerX.com, Copper River Grill & Logo Infusion. Bring your spare game! Top 5 with less than 30 bowlers. Tournament leader gets a bye. Full brackets pay $10 1st & $4 2nd. $5.00 11th Frame.com 300 Pot for Senior Tour ONLY. All money goes to pot. Bowlers must pay to win pot! All left over starts next pot. Every tournament we will raffle Storm/Roto/Vipers Logo items and a CASH PRIZE all money goes into your player of the year.